Our lives are currently under renovation. And, you know, the most wonderful part of a renovation: the improvements and beauty that come out of it. The worst? The dust, the noise, the headaches, the waiting and the dust again. That’s the phase we’re in right now. The dusty, noisy part… the bittersweet, the sad… but, wonderfully, we’re completely enamored of the result waiting on the other end. Not long ago, I was telling someone that when life feels out of control, my normal, every day, run of the mill control freak tendencies crank up about a million notches (something Davey the Hubbers could readily attest to). But the reply was something brilliant, that I wasn’t expecting. She told me that people are not actually control freaks. Instead, she explained that our human nature is to crave predictability. So, when nothing in life feels predictable, we instead embrace our instincts to create the predictability around us. It’s not a control issue at all, but instead a raw look at human nature. I loved it. And I’ve told DTH over and over while I’m doing something outlandishly controlling that I’m simply exerting my human nature. He agreed at first, but now I’m not too sure. The best, most exquisite look at predictability typically displays itself on a plate. A myriad of flavors melding into something greater than the sum of its parts. What’s best is combining flavors that are deliciously and wholly amazing on their own and watching them multiply. Such is the resulting dish of sriracha white wine cream mussels. Sriracha? Bold in its flavor, yet unapologetic with its heat. White wine? Crisp, refreshing and tart. Always. Cream? Endlessly rich, comforting and satisfying. Adding mussels and butter only underscore this completely and totally appropriate menage-a-trois. See, when Davey cooks, we get fancy. In a large pan, saute mussels with olive oil, garlic, shallots, heirloom tomatoes, salt and sriracha. 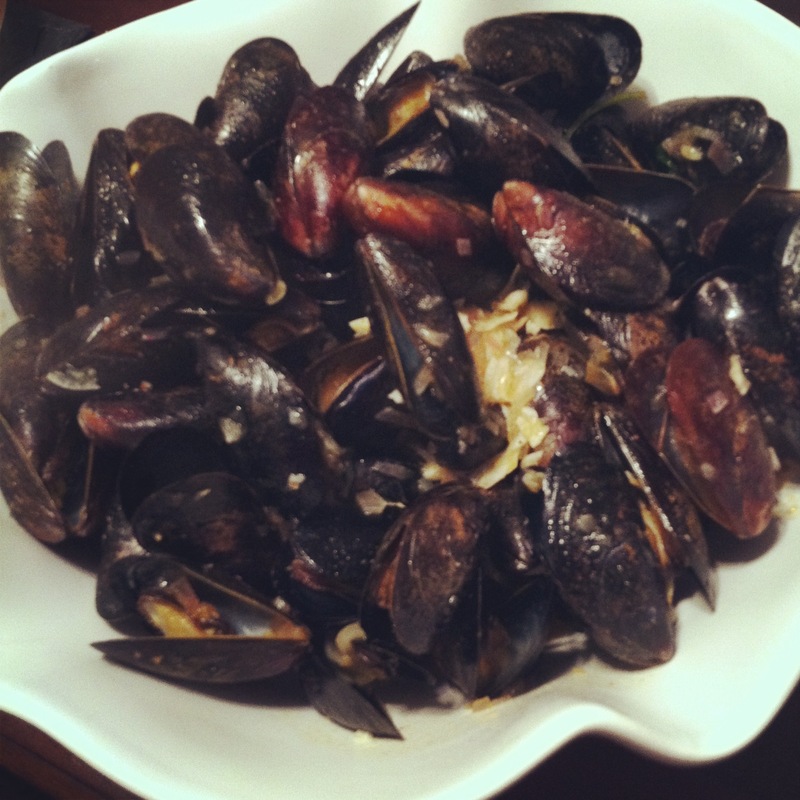 Once mussels open (there may be a few that remain closed, simply remove and toss those), remove them from the pan and keep in a bowl. To the pan sauce, add butter, cream and wine. Bring to a boil and then reduce until sauce begins to thicken. Pour over mussels and tear in fresh basil leaves to taste.